HAVE YOU EVER WONDERED WHY WE FALL BACK AND SPRING AHEAD? Credit—or blame—for the biannual shift goes back to Benjamin Franklin, who published An Economical Project for Diminishing the Cost of Light in a 1784 journal after he noticed that people burned candles at night but slept past dawn. In World War II, President Franklin D. Roosevelt implemented a year-round daylight saving time that was commonly known as "War Time." In 1966, President Lyndon Johnson signed the Uniform Time Act into law. LOVE IT OR NOT? I'm still exhausted! 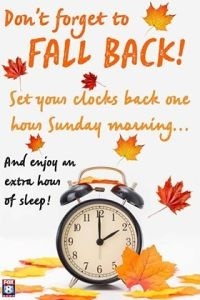 But thank you for the extra hour of sleep or allowing us to remain in bed for the extra hour! Or I'll probably have an extra hour to help you find your special dream home! Don't forget the kitchen clocks and your car clocks too! Even with our technology, some of our clocks have to be changed the old fashioned way!